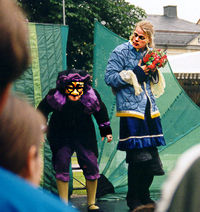 Commedia dell’Arte is above all street theatre, even when played indoors the style is street theatre in many ways. 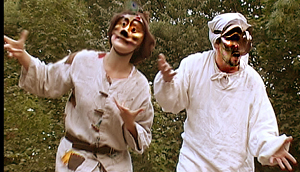 The best way to find out about the difficulties in playing Commedia dell’Arte is by doing it. We will learn that a lot of what we have learned about “strait acting” does not apply to Commedia dell’Arte. It has to do with that Commedia dell’Arte is street theatre where everything is bigger, faster, louder, wilder, more energetic and therefore more structured and disciplined. It also has to do with acting in a mask. The laws and conventions for mask acting is not the same as for other styles of acting as we shall see. We have to act in with an audience at an early stage. Since Commedia dell’Arte is so much about the audience and interacting with the audience, it will soon be very dull if we are trying to rehears without the audience. It does not only give freedom to the actor when he knows what works and not. Most actors are not comfortable with acting with the audience. They rather act to the audience or, in worst case, for them. We shall not be supercilious and put our noses in the air. Commedia dell’Arte is vulgar comedy. It shall be understood and appreciated by everyone, young as old, and rich as poor. The base is about – as in all art – communication, and in this case it is about the simplest, fastest and most effective communication possible.